See "Croatia - Lodging" for a detailed account of our recommendations. Croatia is a fascinating country to visit but the biking conditions aren't great. The road surfaces are often broken or deeply warped from the heat and traffic and there is rarely even a wisp of a shoulder. The drivers are aggressive, they take foolish risks when passing, and tend to drive like bikes aren't really on the road. Polish drivers are the only other drivers we really dislike sharing the road with. (Italians are fast and aggressive drivers but at least they are kind to bikes and factor us into their decision making.) In the early winter of 2001 we tried to ride the coastline south from Rijeka but I found it too frightening and we had to turn back instead we headed south on the islands. We were very sorry to discover that even on a generally excellent map like a Freytag & Berndt 1:200,000, that the paved and unpaved roads were indistinguishable for northeastern Croatia. More than once in eastern Croatia we headed out on what was expected to be a low traffic but good quality road only to find ourselves pushing our loaded bikes up steep, deeply rutted, gravel roads on days we'd planned on doing extra miles. Buses rather than trains are the way most people get around in Croatia. We put the bikes on buses a couple of times when traveling along the islands in 2001 when the notorious bura winds kicked up. It was on a "space-available" and "at the driver's discretion" basis so sometimes we had to wait for the next bus to get them on but the buses were usually frequent. In 2004 we biked east from Zagreb to Vukovar which was better than the coast in 2001 as there was a freeway paralleling our road to decrease the traffic but we still felt that the drivers were creating a dangerous environment for us. As an entry into Serbia this route provided a fascinating and frightening look at the remnants of the wars between Serbia and Croatia but I wouldn't recommend it for a relaxing, scenic tour. Things have improved for travelers and cyclists in Croatia since our 2001 visit. The prices on groceries were still often double what we paid in the EU but EU grocery chains have invaded Croatia and the quality of food is definitely better. The new freeway that is incomplete is pulling traffic off the Adriatic highway along the coast and we were satisfied with biking it in 2007 and it was even better in 2008. The terrible pavement south of Rijeka has also been repaired, making the much narrower road quite tolerable. Even in shoulder season in September, Croats were in the minority on the road. Many more drivers were from bike-friendly places like Germany, Austria, and the Netherlands and so the level of courtesy we were shown as cyclists was high. And September was warm enough that we didn't need heat in the rooms to be comfortable at night. Unfortunately, Croatia is in the 'almost, not quite' category when it comes to long distance, seashore, multi-use paths. Many a time we've been on an idyllic, single lane road that extends several km beyond the village and almost, but not quite connects with the main road. We've gotten off our bikes to scout for hidden links and don't find them. Instead, we've always had to backtrack and take the main road out of town. These little roads provide wonderfully idyllic interludes to enjoy if you have the time but if you're in a hurry, stick to the main streets to rejoin the highway. The same is true when on foot on the pedestrian promenades along the sea: you'll be enjoying one for a mile or 2 and then may have to walk along the highway to reach the next segment. "Oh, if only Croatia could spare the money to connect all the dots," it would be surreal. I always imagine that there are bands of German ex-pats who come from the land of amazing bike networks who are scheming as to how they can link-up paths in their favorite areas. The lodging and lounging happens in Opatija (o-PA-te-yah) though 10 miles south is Rijeka (ree-A-ka), the big city with the train station and port. If in Opatija, look for the "Lungomare" or seaside walk that heads towards, though doesn't make it all the way to, Rijeka. Good footwear and a willingness to get wet is needed for the more distance segments but even the tamer parts are an enchanting way to experience the Mediterranean and the Italian influence on Croatian culture. Rijeka isn't a tourist town but a transportation hub—the tourist facilities are north at Opatija. But Rijeka is home to the regional big passenger ferry port, has the regional bus terminal, and is the end of the line for significant train service. Most of what is essential to the traveler is within a few minutes walk of the bus station. If you are standing at the “Autobusni Kolodvor” (bus station) with your back to the sea, the shopping district is across the busy street and to your right. Bus tickets can be purchased in the corner office on the sea-side of the bus parking lot. Left luggage (“Garderoba”) is a few doors down from there, away from the sea. In early 2009 it cost 13 kuna ($2-3) to have a suitcase held for the day. The Jadrolinija ferry company office is a block to your right on Zadarska street, between Adamiceva and Riva. Across the busy street from the bus terminal, heading inland, are free public toilets. Continuing to the right, watch for the circular fountain, which marks the near end of the pedestrian mall. The tourist info office is a few minutes walk down the mall on your right. They will give you a free map of the center and answer your very specific, insistent questions in English. Most of the clerks are quite skilled at deflecting the more passive tourists in multiple languages. In the basement of the Korzo department store on Korzo street a bit beyond the tourist office and on your left, you'll find a typical, mildly disappointing grocery store. The toilets are in the bar adjacent to the “Kerum” supermarket entrance but the waitress may give non-paying customers a scowl. A large though discretely labeled post office is farther along the mall than the Korzo market and on your right, as was the tourist info office. I don't recall the name, but the better internet shop in town is at the far end of the pedestrian mall in the vicinity of the little marina. Perhaps it's in the ground level of the Hotel Continental. Shopping is always disappointing to us in Rijeka. The big book stores, electronic stores, sporting goods stores, and bike shops either aren't there or are hard to find. There is a big mall of mostly quite small shops as you continue southbound—take a bus rather than walk. There is a large Konzum grocery store there too. About a 30-40 minute walk up into the hills and in a more northerly direction is a cluster of large stores, including 3 supermarkets (Mercator, Lidl, and Konzum) and Merkur the hardware/home improvement chain. Bus #5 goes out there. Buy your bus ticket at a tobacco store for a better deal than buying on the bus—ask tourist info to give you the current info. There is a (relatively) nice park for a picnic across the street on the uphill side from the markets. Other conveniences include a small post office in the Konzum, ATMs, and free internet (for the price of a beverage) in the Merkur cafe. The main road into Zadar for southbound travelers is #8 which comes in from the northeast. The last 5+ miles is a fright for cyclists. It's a narrow, mostly shoulderless truck route. We've done it at least twice and won't do it again. Bus might be an option though we'll give the minor road that swings farther north a try. It looks like it might be more hilly than #8 which has a fair bit of elevation gain on it already. Previously we've headed out of Zadar on the main road to Biograd but in 2008 Bill instead routed us on to the nearby islands. We took a ferry from Zadar to Preko on Ugljan Island, then rode about 30 km to Tkon on Pasman Island and hopped the ferry to Biograd. (The 2 islands are connected by a bridge.) The process consumed most of the day as the off season ferry schedules were limited but it was a treat to have the roads to ourselves for a day. Split is challenging to navigate on a bike whether you visit or bypass the city. The old town is a must-see for history buffs and a fun stop even if you don't care to expand your Roman history knowledge. Lodging is challenging and we haven't stayed anywhere that we'd stay a second time. Riding into the city is hard work and a map is a huge help in dodging some of the steep roads and the worst traffic. It is slow going at best. In 2008 we decided to bypass Split and that too was harrowing. The main road was like being on a freeway and not getting clobbered by the traffic exiting into the center was a near thing. We lacked a detailed map but will search for yet another way around Split. South of Split, this is a lovely stretch of coast line. www.makarska-riviera.hr; Tel +385 (0) 21 616 288. From Pisak in north to Gradac south of Makarska. Just after crossing the stunning suspension bridge, take a sharp left and drop down to the sea level. Once at sea level, make the hairpin left turn so the water is on your right. That will take you into Dubrovnik on the less-traveled road. If you stay at the level of the bridge, you cruise above Dubrovnik on its highest, fastest through road with a lot of trucks. The approach from the north is intense but isn't as treacherous as the road at the south end of the city. The main road at the south end of town is hair-raising on a bike. Rather than mix it up with the trucks and tuck away more elevation gain on an 8% truck route, we took Frana Supila south, which we picked up south of the old town. We ignored one-way street signs and 'Pedestrian Only' signs and worked our way onto an upper, semi-closed, cliff-side road that intersected the main road after about 4 km. Barricades at the far south end of the closed road necessitated unloading our bikes to lift them over the obstacle and onto the main road, but it was worth the extra effort. We set-up the bikes on the opposite side of the road by a memorial to get well out of traffic. Ride around the gate on the upper road to leave Dubrovnik. Here's where the barricaded, closed road rejoins the main road. After about 1-2 km (guessing) on the main road from the closed road where we had to portage over the barricade, we turned left down to the Getro and Lidl markets at the village of Zupa dubrivncka. They are both good stops for loading up on groceries and for getting you off the main road. 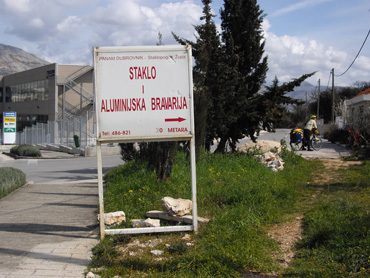 If you aren't shopping or when you are done, look for the upper road in this ravine--the road above and generally north of the Getro and Lidl--the one with a white sign that points to an aluminum works "Aluminijska....", which will start you south again. Just before the sign there is a bright yellow building with red trim near the road you want that looks like it is on its way to becoming a Billa supermarket. Wander through the village roads, bearing generally to your right when in doubt though the road will swing you out to your left. You'll take a right turn down a short, steep street connecting you to a little larger through road. The road will eventually swing widely to the left of the valley but it will eventually rejoin the main road after bypassing some of the worst traffic. Things lighten-up on the main road after this detour and you'll be in for some great coast views. 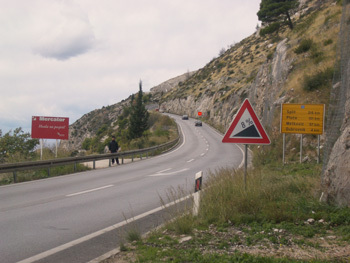 There is a second traffic bypass south of Dubrovnik that begins at the village of Cilipi by the airport. It's a paved road and it runs between the main road and the sea. It adds both distance and a lot of gain to your day, but we thoroughly enjoyed it. The traffic it spares you isn't fierce, but the tranquility is a joy and the typical Croatian scenery was far better than on the main road. Finding the back way into the supermarket area described above would be tricky and we haven't done it. Coming from the north, we rejoined the main road at the southern end of the town of Kupari, about 10km before Dubrovnik. The road you want is at the city limits sign of Kupari and there is a prominent sign for a Konzum market on the road and a Mercator market off to your left. There is a Y junction there on your right and you can take either segment to get on to the little road. After several km you'll want to take a steep street off to your right that will turn sharply to the left at the top. That will put you on quiet village streets. Perhaps have "Lidl" and "Getro" written on a piece of paper and ask along the way and indicate that you want the little road when they send you up to the truck route. You will have a steep climb up from the shopping centers but it beats being out there with the traffic. If you are up to a little more adventure to avoid traffic on your way into Dubrovnik, read the section above about portaging your bike and bags over a barricade and onto an old road with grand views and no traffic. Prices are high in Croatia--not like Switzerland and Iceland, but still overpriced. The prices on familiar brands of tuna and muesli cereal are double in Croatia compared to those in Euro-land and US . And the quality isn't always good. We had our first terrible picnic lunch in months or years in Croatia: the bread was bland, the only cheese we could buy was a barely digestible, highly processed cheese made specially for melting; the under-filled tuna can contained a mealy mush barely recognizable as tuna and only 1 of our 2 apples was good. It's one thing for us to occasionally be saddled with marginal food but I pity the average Croat's with a salary of just over $10,000 wasting their money on it. Western European retailers are increasing their presence in Croatia, which is a good thing for travelers. No longer having to do most of our food shopping in barely lit stores with limited inventory--much of it out of sight behind the counter, and rotting produce does diminish the cultural immersion experience but it's better for all to enjoy higher standards at the same prices. DM, the German non-pharmacy drug store, can be found in the pedestrian shopping areas of the bigger cities like Pula and Zadar but also DM has a large shop in the center of Novi Vinodolski and outside the gate at Dubrovnik. In addition to toiletry items, DM also carries some hard to find food items we appreciate like bulgur, ground and whole flax seed, and nice quality muesli cereal. Lidl, which isn't a favorite grocery store of mine elsewhere, is a welcome addition to the Croatian scene. They carry 70% cacao JD Gross Ecuador chocolate bars which are a super value, as are the frozen vegetables. They appeared to be opening up a string of stores in 2008 as we shopped at one in Labin in Istria, spotted the 'opening soon' sign for one 3.5 km out of the center of Rijeka (bus #5 on Osjecka street), located 2 in Zadar, saw one on the main road on the north end of Vodice and expected to see them in Split though we bypassed the city this year. Ploče acquired a Lidl since we were there in 2007 down by the port. It's probably about 2 km from the turn-off from the main road; the 150 m sign is the distance to the turn-off, not the store. Dubrovnik now has a Lidl at a shopping center 10 km south of town. 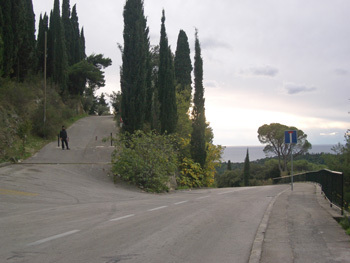 Billa has been in the outskirts of Pula for years and is on Opatija's upper road. 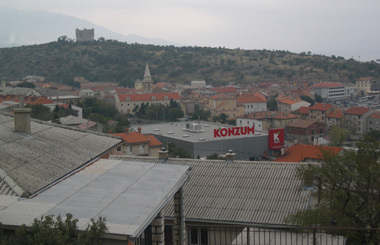 The big, new Konzum supermarket is hard to miss in Senj. And it seems that the outside competition is raising the bar for the local, formerly dominant market chain, Konzum. Some of their meager little shops still make me recoil but in more and more Croatian towns they are becoming a formidable competitor earning customer loyalty. Their bigger locations stock our favorite red pesto sauces. When we returned to Croatia in March of 2009 we discovered that a January 1 government decree had forced almost all shops to be closed on Sundays. Restaurants were still open but the many food markets that used to be open until 1 pm or later had their Sunday hours painted over and were closed. The ban would be lifted for the summer trade for the tourist trade on the coast. The closures were in response to pressure from the Catholic church. Otherwise, the supermarkets are often open 'non-stop' (a commonly understood expression) from 7 or 8 am until 7 or 8 pm. Then there are the exceptions, like the market we were counting on in a small town that closed for the day at 2:30. Non-food stores will likely be closed all afternoon, opening again about 5 pm. Buses are the public transportation method of choice for most of Croatia. The bus system is easy to use and reliable. By your tickets in advance from the nearby office rather than from the driver. Suitcases stashed underneath the cabin area will be charged 10-15 kuna each. Look on your ticket for the word "Sjedalo" which will precede your seat number if seats are assigned, as they often are for longer jaunts. Dubrovnik: Check-out www.akdubrovnik.hr for the intercity bus service info. In the off-season the bus from Dubrovnik to Kotor, Montenegro leaves every day at 10:30 am for the 2.5 hour journey and at 3 pm on Tuesday, Thursday, and Sunday afternoons. The ticket costs about 100kuna or $20. You will be charged 1-2€ for each bag that goes under the coach (and our driver asked for it in Euro's, not kuna though accepted kuna at an opportunistic exchange rate.) At times there are also buses to Kotor at 7 pm and 8:30pm. Buy tickets the day before to guarantee a seat in the busy season; a half-hour before departure in the low season. Take your motion sickness pills if you are prone as the driver's gun-it on this very windy road. The ferry from Dubrovnik to Rijeka operates on Thursdays and Sundays, leaving for the 22 hour trip at 9 am. In November 2008 an outside cabin for 2 was 1110 kuna, which compared favorably with 920 kuna for bus fare for 2 since the boat trip also includes lodging (which runs at least 250 kuna). (7kn = 1€, 5 kn = $1). There is a 20% discount on round trip ferry tickets with an open ended return. The ferry from Rijeka to Dubrovnik makes the run on Friday's and Monday's, leaving at 7 or 8 pm (departure times in 2009 were 7pm thru 3/17 and 8pm beginning 3/21). Buy your tickets the day of sailing in the off-season incase the sailing is cancelled due to bad weather. Ask for a cabin on the upper levels to get away from the sickening engine fumes and deafening engine noise. The off-season ferry is small and decidedly unglamorous. We always bring our own drinking water for any ferry voyage. Post offices in smaller communities often don't reopen in the afternoons though are likely open Saturday mornings. It is possible to receive mail, though perhaps only letters and not packages, using a General Delivery type service. In 2008 we excepted to receive our election ballots this way using the express mail service of the US post office for about $80. The designation was "Poste Destante", plus the postal code and the city associated with the postal code. In our case that was "Our Name, Poste Destante, 23000 Zadar, Croatia." Unexpectedly, our parcel wasn't handled by the domestic post but a private Croatian courier once it arrived in the country. They called us from Zadar wanting a physical address to which to deliver. If we hadn't had a Croatian cell phone number which was included on the package I doubt that we would have received our shipment at all. From the US, use 011 as the access number followed by 385 for the country code. Many of the cell numbers begin with 0 which should be dropped on international calls. If you have a Croatian SIM card and are in Croatia and see a phone number formatted like this: +385 98 950 7281, drop the country code (+385) and add '0' and dial: 098 950 7281 to make your call. If you have an unlocked phone that works in Europe, "Tomato" (pronounce "toe-mah-toe") is the cheapest for short-term visitors. No contract, no paperwork, no extra charge for the SIM card--couldn't be easier. You can buy the SIM cards at some tobacco shops. In 2008, the Tele2 recharge for 25 kuna only lasts 10 days; 50 kuna (about $10) lasts 3 months. www.pp-medvednica.hr has photos of poisonous and non poisonous forms.